Shoes are an important part of maintaining the overall health of your feet. Many patients’ foot and ankle problems stem from faulty or improper shoes. Shoes can also be an integral part of the recovery of a patient in the post operative phase of treatment. Running shoes are the most comfortable and convenient shoes available. A running shoe provides a superior balance of lightweight material, excellent shock absorption properties in the midsole and a generous toe box. Just like our bodies, a shoe has a specific anatomy to understand. Toebox: The area in the front of the shoe containing the toes. The size of the toebox is important to accommodate bunions, hammertoes, and other maladies. Having adequate space can decrease the friction and irritation from these problems. Toebox design varies from model to model. Some models are specifically made deeper and wider to accommodate various foot shapes. 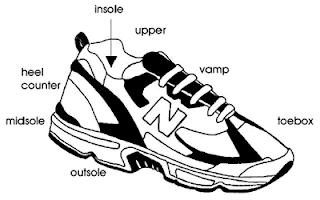 Vamp: This is the area of the shoe where the laces are found. Lacing pattern can affect how the shoe fits. Some people experience impingement of nerves and tendons on the top of their foot if the laces are not in the proper place. The best way to see if this will be a problem is to try the shoes on and test them. There are alternative methods to lace shoes up that can help prevent the heel from slipping during ambulation/running or relieve pressure points that can result from a high instep. Insole: The bottom inside portion of the shoe that is in direct contact with the foot. Most shoes have removable insoles that aid in creating space when prescriptive inserts or orthotic therapy is needed. Good insoles are made from compressible foam that will mold to the contours of your feet. It should be noted, however, that most insoles that come with shoes will break down a lot faster than the shoe itself. There are a large variety of over-the-counter shoe inserts that can aid in prolonging the comfort and life of the shoe. Outsole: This is the portion of the shoe in direct contact with the ground. The traction pattern and materials of the outsole are specific for the playing surface. For example, a court shoe will be flat and flexible with a lot of traction, while a trail-hiking shoe will have a more rigid outsole with more aggressive traction pattern. Midsole: This is the layer that lies between the insole and outsole. Most of the technology of shoes is focused on this area. The majority of the midsole contains ethylene vinyl acetate (EVA) foam, polyurethane foam or a combination of the two (dual-density midsole). EVA foam provides better cushioning but has less durability than polyurethane. In addition to foam, many companies have their own cushioning systems, such as air bladders, honey-comb cut foam, shock-absorbing gel materials and various other high-tech materials. The support of the shoe is very much based on the construct of the midsole. In the past, there was a tradeoff when it came selecting between support and cushioning. In general, it used to be that the more supportive midsoles resulted in a heavier and less cushioned shoe. Today, knowledge of foot function and advances in materials and shoe design has blended together to produce shoes that offer maximum support without sacrificing cushioning or weight. Some shoes contain different densities of foam or more rigid devices (such as plastic heel plugs) in the midsole that aid in controlling abnormal foot motion. It should be noted that midsole cushioning can be too soft, leading to maximum compression of the material, which can in turn result in a loss of support. Also, with less cushioning comes less shock absorption-less shock absorption is linked to degenerative changes in joints and low back pain. Finally, one needs to be aware that the use of orthoses in shoegear with extremely soft midsoles may decrease their ability to control abnormal motion. Heel Counter: The heel counter wraps around the back of the heel and acts to stabilize the heel and aid in motion control. Sole: The sole refers to the insole, midsole and outsole combined. Upper: The upper holds the foot to the sole and is generally the most aesthetic part of the shoe (colorful, company logo, etc). One should be warned… while how a shoe looks is important; it should never take precedence over the function of a shoe. The fact is that the “look” of a shoe will not prevent injuries associated with improper fit or function. The good news is that most companies are designing great shoes with a decent blend of support, cushioning and style. This is the first time, I am reading about the shoe anatomy. Very unique and helpful information. thanks for sharing a worth to read post.